Dental care and oral health for our pets has become a popular topic among pet parents and veterinarians. It can be hard to know what we should and shouldn’t do for our pet’s dental care. Here are some hints to keep your dog and cat’s teeth healthy. Do ask your veterinarian about your pet’s oral health. Veterinarians are trained to look for signs of dental disease in our pets. If we recommend a dental cleaning, it’s not just for better breath and shiny teeth, we are more concerned about the overall health of your pet. Periodontal disease, which is the inflamed gums and bone loss due to plaque and tartar accumulation, may lead to damage to the heart, kidneys and liver. It can also make your pet feel lethargic and weak. Additionally broken teeth can be a source of pain and infection. These damaged teeth should be treated when noticed. Don’t provide chews that may damage the teeth. Many people think that bones, hooves and antlers help keep the teeth clean. The thought is animals in the wild chew bones, so they must help. These items are the major cause of broken teeth. Dog and cat teeth are not any stronger than our teeth. However their jaw strength is greater as is their zeal for chewing. This often leads to painful tooth fractures. A good rule of thumb is if you think it is too hard for you to chew, it is too hard for your pet to chew. And those wild animals that chew bones? They have a lot of fractured teeth as well. Do brush your pet’s teeth. It may sound crazy to some, but brushing your dog or cat’s teeth is the single best thing you can do at home to keep their mouths healthy. Any pet formulated toothpaste is acceptable. As with any new activity with your pet, approach it slowly and add positive rewards. It’s okay if your pet gets a little treat after having their teeth brushed. At a minimum, this should be performed every other day, but daily is best. Don’t use human toothpaste as it may be harmful to your pet. Do have anesthetized dental cleanings performed when needed. As long as the proper precautions are taken and anesthesia is monitored closely, the risk of anesthesia is far lower than the risk to your pet’s health by not having a proper cleaning performed. The time between cleanings varies based on the pet, but it can be lengthened if started early in life and we do things at home to keep the teeth clean such as brushing and giving good dental treats. 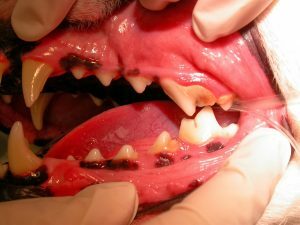 Don’t allow your pet’s teeth to be cleaned without anesthesia. Cleanings without anesthesia seems like a good idea. However the tartar below the gumline and between teeth cannot be removed. This tartar is the cause of most periodontal disease. Proponents of cleanings without anesthesia prey on our fears of anesthesia in order to drive business to their door. However it is at best only tooth grooming and at worst may make the disease worse. Do ask for a second opinion if you aren’t comfortable with a recommendation. If ever you are unsure about a recommendation, it is always within your rights to ask for a second opinion. 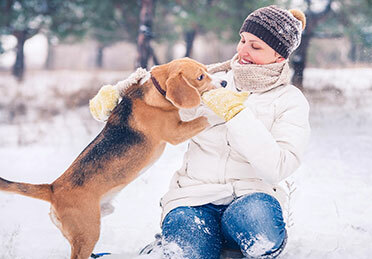 Following these general guidelines can help keep your pet healthier and happier.